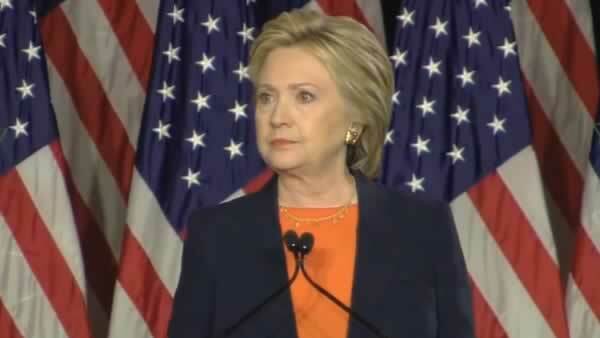 SAN DIEGO (KGO) -- Hillary Clinton unleashed a major foreign policy attack on Donald Trump Thursday, using a speech in San Diego to cast the Republican as unqualified and dangerous. She seeks to undermine the billionaire businessman's qualifications by casting him as someone who "doesn't understand America or the world." She says Donald Trump is "temperamentally unfit" to be president and argues the presumptive Republican nominee is peddling foreign policy proposals that are "dangerously incoherent." The former secretary of state and likely Democratic nominee says she is offering a "smart and principled" foreign policy that centers on keeping America in a leading role around the globe. She contrasts that with Trump's vision of a "fearful America" that she says would be less secure and less engaged in the world. Clinton says the next president must bolster America's security by investing at home and sticking together with longtime U.S. allies. The likely Democratic nominee says she would invest in infrastructure and seek to reduce income inequality, arguing the U.S. can't lead effectively when so many of its own people are struggling. Seeking to draw a sharp contrast with Donald Trump, Clinton says the U.S. must also maintain strong partnerships with its allies. The presumptive GOP nominee has raised the prospect of the U.S. leaving NATO and has said allies must contribute more financially to security agreements with the U.S.
Clinton says that if Trump gets his way, the U.S. will be increasingly isolated and countries like Russia will be "celebrating." Hillary Clinton is defending the landmark nuclear accord with Iran championed by President Barack Obama and other world powers. Trump has criticized the diplomatic agreement aimed at dismantling Iran's nuclear program in exchange for easing global economic sanctions. Clinton challenges the presumptive Republican nominee to answer how he would deal with Iran in the absence of a nuclear deal. Trump has argued that his experience negotiating business deals would have allowed him to strike a better deal with Iran and has also said he would have walked away from a bad deal. Clinton says that while that might work in negotiating a golf course deal, "it doesn't work like that in world affairs."